MSP Radio Special Edition for Our Veterans - Thank you for serving. On Veterans' Day in America, we are publishing a program aired last week hosted by Nate Teplow for MSP Radio one of our SLMA radio special programs. 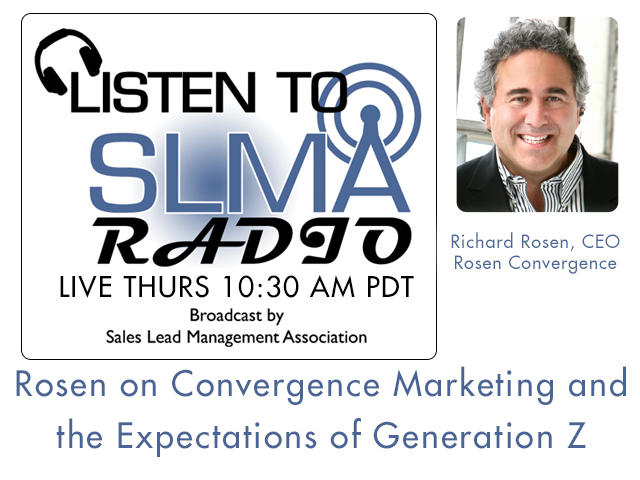 We think is worth repeating to SLMA Radio listeners. Veteran’s Day is this week, and people across the nation are taking the time to honor and remember our veterans and all they do for our country. The military teaches our veterans a unique set of skills, both technical and interpersonal, and for this reason, many veterans often find jobs in IT when they return home from service. On this week’s episode of MSPradio, we chat with Hire Heroes USA, a non-profit organization that helps veterans find jobs after returning home from service. Kelly Dempsey, Director of Communications and Corporate Relations, and Brian Stann, CEO, will tell us a little about the organization and the valuable skill set that our veterans possess as a result of serving our country. Tune in now to this special, Veteran’s Day episode of MSPradio. Strategic Volunteering - When saying Yes is bad. 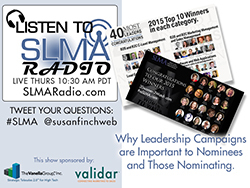 Cyndi Greenglass, Senior Vice President, Strategic Solutions for Diamond Marketing Solutions was interviewed by Susan Finch about strategic volunteering. Finch, as the founder of a national non-profit, Binky Patrol has been at both ends of this discussion. She and Cyndi were in line with their thoughts and recommendations about strategic volunteering. Is volunteering different than philanthropy? How much volunteering do you do? How did you decide where to volunteer? Why do you say that volunteering can be bad? Does this seem self serving? What is your advice on how to choose? Are you good at saying no? What advice do you have for other women to say no? Have a personal plan - how does this opportunity/organization fit into your plan? If it does not - say, "No." At least say no until you figure it out. What if you have 10% of your time allocated for volunteering and this new opportunity would add another 5-10%? You either need to pull back what you were already doing to make room for this new thing, or take a pass for now so that you don't do a shoddy job volunteering for either organization or project. Can you leave us with 3 takeaways on how to become a strategic volunteer? Men tend to identify mentors at early age - in their career and at a personal level. This development use in a positive way volunteer contacts mentoring opportunities - networking, etc. Quickly identify if it is not a good fit get out fast. Theirs will be a pre-conference intensive workshop. Review how B2B databases are structured, and how to find the last crumb of useful information about customers and prospects, both internally and externally. Focus will be placed on internal data sources, compiled and response databases, as well as physical and digital sources of actionable data. You will learn specific steps for keeping your customer information fresh and clean. This session will focus on offer development in B2B, providing key insights and examples of successful offer and creative in social media, mobile, and print communications. Case studies will illustrate excellent online and offline copy, design, and offer tests, and exercises will allow attendees to craft social media messaging that drive results. You will learn how to craft compelling offers at each stage of the buy cycle. Cyndi is responsible for marketing and strategic solutions and manages our agency services team of data, analytics, creative, and digital professionals. With a strong track record in marketing, strategic planning, and database development, she helps our clients “market smarter” by providing strategic solutions. 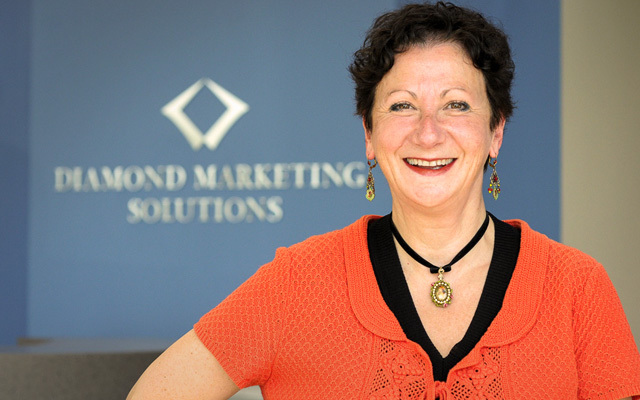 Prior to joining Diamond Marketing Solutions, Cyndi launched World Marketing Integrated Solutions, an integrated database and strategic marketing consulting firm. Her background includes 10 years in international business consulting with the U.S. Embassy and the U.S. Foreign Commercial Services. Cyndi is a past president of the Chicago Association of Direct Marketing and past chair of the Direct Marketing Association Business-to-Business Council. 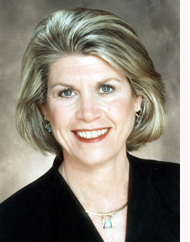 She is a frequent presenter at major DM industry conferences and is an educator at several universities. Cyndi has twice been recognized among the Top 100 BTB Marketers by Crain’s BtoB magazine. 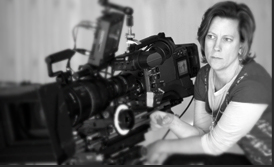 Susan Finch interviewed Vicki Donlan. 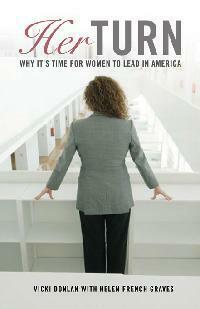 Vicki is a Business & Health Coach, Speaker and Author of HER TURN: Why It's Time for Women to Lead in America . What a lot of women don't realize is that MEN with daughters are the biggest supporters of women becoming successful. They want to know that anything is possible for their daughters. Women don't remember to connect the dots. Men look at every opportunity to connect and grow their business relationships. Women spend more time separating personal from business. Why? As a young girl, Vicki's father would take her to work with him. He would introduce her to many important people. But instead of saying, "Vicki, you need to meet so and so.." he would say to the person, "You need to meet my daughter, Vicki." His support came through in every subtle thing he did to expose her to the business world. She grew up knowing she was important and could do anything. Are you giving that gift to young women, teens and your daughters? Women are natural nurturers and relationship builders, then why is it that men are the ones who rarely speak negatively about each other - especially in business? Women need to be SUPPORTIVE of other women and bring them up with them through their successes, build them up when other succeed, talk about them as if you are a proud parent or friend. Become less judgemental. This includes judgemental about women's looks, career choices -anything they do. Support women every time you can! When one succeeds we all win. Participate and support women's groups. We get through the obstacles faster when we meet and discuss as s group. There is a different level of collaboration, discussion and support when it is just women with women. Nothing wrong with being in co-ed groups, but don't forget to set aside time to just be with other professional women. Be a mentor. We are all mentors and all mentees. Reach out early and often and we have an opportunity. This applies to ALL ages! As an entrepreneur, she was founder and publisher of Women’s Business, a 25,000 controlled-circulation newspaper devoted to women in business in the Massachusetts, New Hampshire and Rhode Island region, founded in 1998, and sold to the Boston Herald in 2004, remaining as publisher through 2007.Her first book HER TURN Why It’s Time for Women To Lead in America was published in September 2007. She is a regular guest discussing women in business on New England Cable News’ Business Day and a well-known speaker. As a business coach and health coach, and, most important, as a woman, she understands the pressure that is put on women in our culture to take care of others and still be perfect in all ways as a woman, mother, wife, businesswoman, entrepreneur, volunteer, and community activist. Why don’t women take credit for their accomplishments? 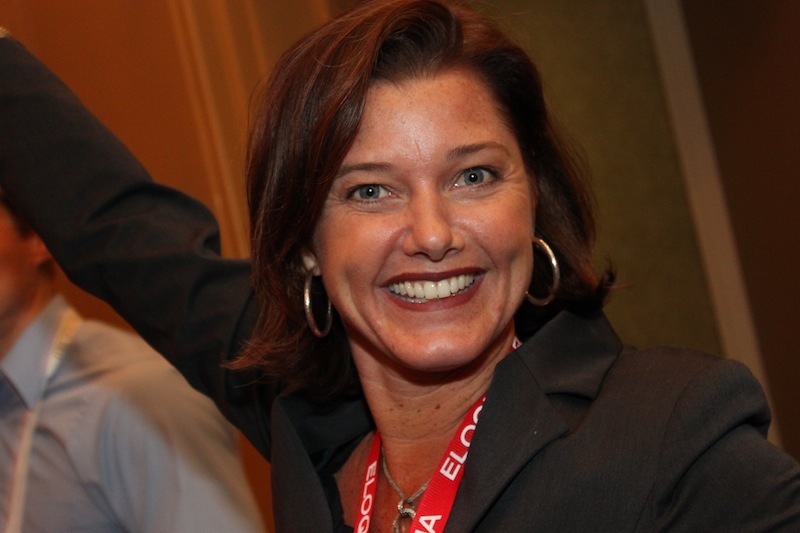 Jill Rowley continues to be a force in the sales lead management industry. A pioneer in the space, Jill has become an expert and global companies (Rally Software, DocuSign, ArcSight) turn to her for guidance and knowledge. In working closely with Jill, she continues to show herself as more than just a sales rep, but a trusted advisor in the area of sales lead management and the new world of buyer driven marketing and sales. 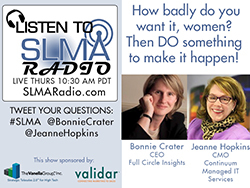 SLMA Director, Susan Finch will be having a conversation with Jill talking about what keeps women from taking credit for their own accomplishments. 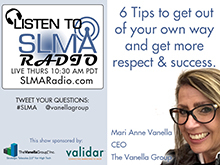 What separates women who are comfortable standing up for themselves, their skills and accomplishments; versus those who quietly let credit be given away, usually to a same-level man or supervisor man or woman? Awarded Eloquan on the Year for 2011 - Eloquan of the year is given to an Eloqua employee who meets criteria including: passion, knowledgeable about the technology, mentor, and active in the community. Jill encompasses all of this and more.